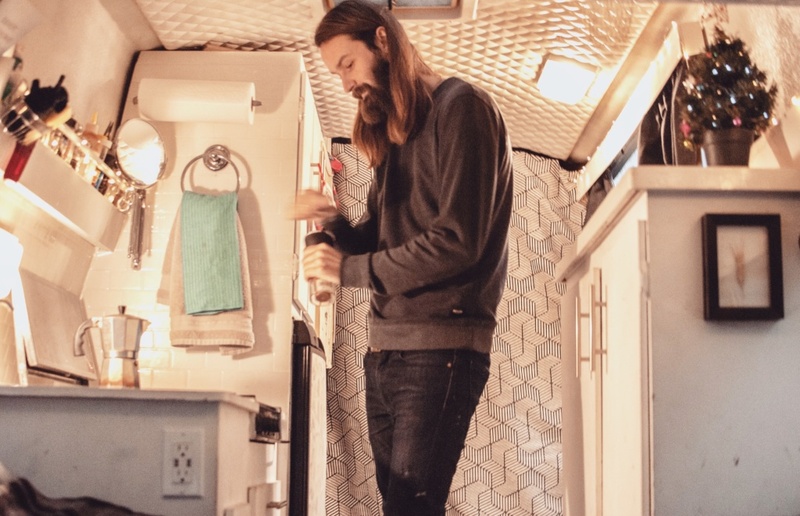 19 DecLooking Back on a Year of Vanlife: What Would We Change? We’ve definitely learned a lot about van living in the past year and what works for us and what doesn’t. Here are 5 things we’d change about our van if we were to do it all again (plus a couple of our favourite features). Unlike many vanlifers these days with decked out Sprinters and high-end school buses, we bought an older van that was already converted. 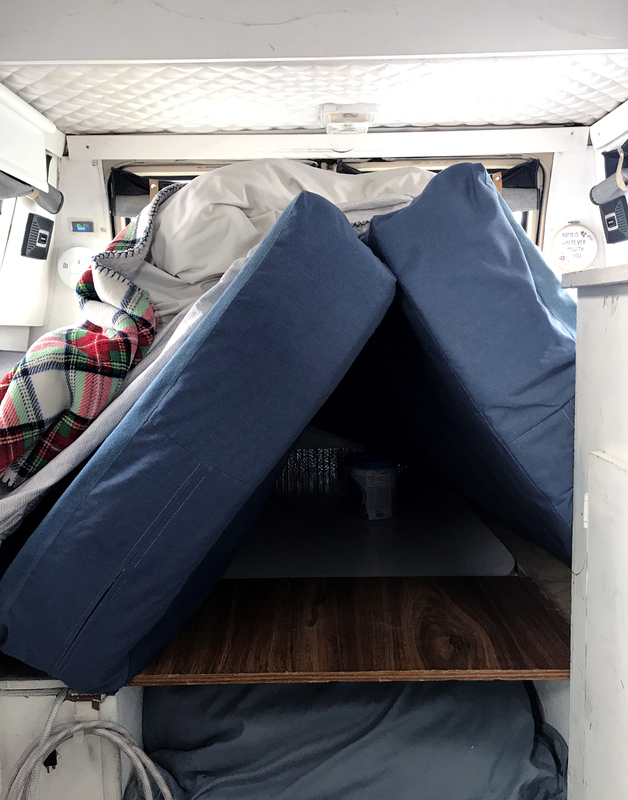 Wanting to spend more of our budget on travel than renovations, we kept the existing layout of the interior of the van and focused mainly on aesthetic upgrades like painting the cabinets and ripping out all of the god-awful green carpet trim. You really can’t anticipate what you might need or want to do differently until you move in and start living. We’ve been quite lucky with how our van is set up because the flow really does work well for us. That being said, if we were to gut the inside and start fresh or begin with a blank canvas like an empty Sprinter, here’s a few things we’d change. Our bed is super comfy and surrounded by windows that allow us to feel like we’re in a glass bubble even when we’re inside. It also doubles as a dinette in a classic RV style where the centre of the bed attaches to two metal poles to form a table and the header and footer of the bed become bench seats. In theory, this is an ideal set-up for making the most out of a multi-purpose space. In reality, we rarely ever make the bed into a table and just end up sitting on the bed to eat dinner, work on our laptops and just hangout. Especially being wintertime, we have so many layers of blankets on the bed that it can be a bit of a hassle to put them all away when we want to use the table. You can call us lazy but at the end of the day, we would really value having a bench seat of some sort to give us a place to sit and to not have to cram everyone onto our bed when we have friends over. 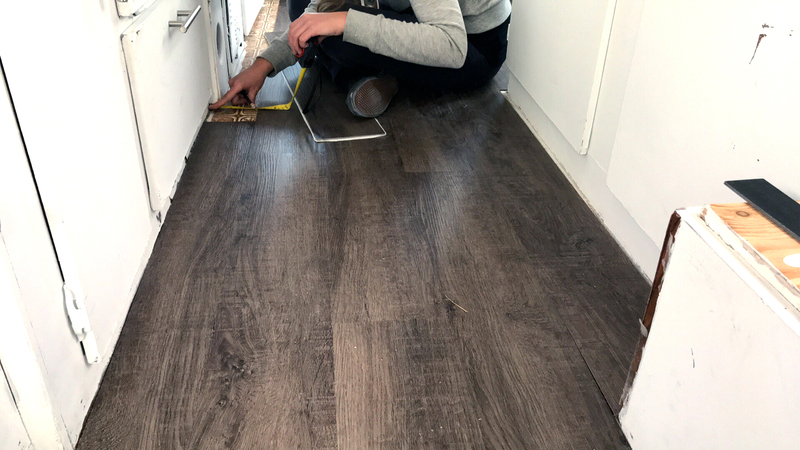 Although we didn’t build out our van from scratch, we did remove a lot of the existing finishes and kind of regret not completely tearing up the old floor to add a layer of insulation. In the interest of time and head space, we installed our faux wood floor directly on top of whatever thin wood was below the old carpet. Justin already can’t stand up in the van so losing another ½” in height in exchange for a warmer floor might be a worthy trade-off. 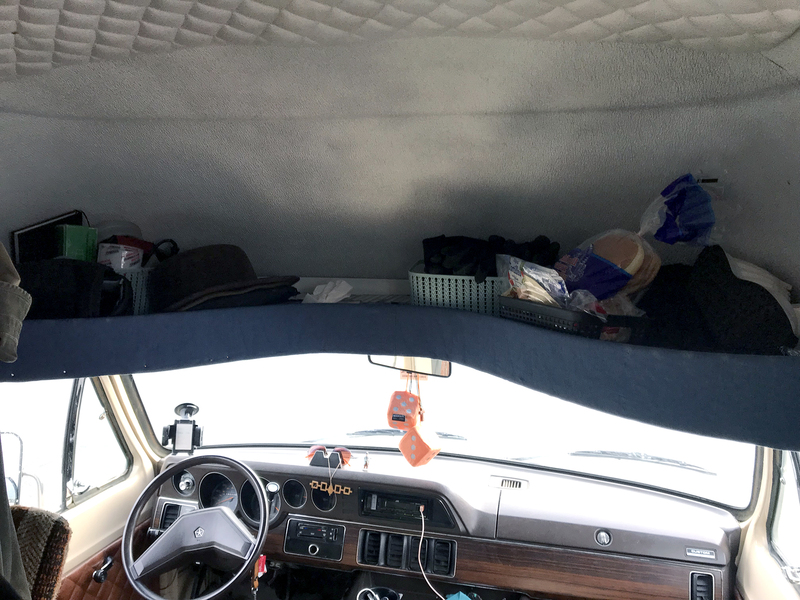 Our overhead storage in the front is fantastic for storing our shoes, snacks and other quick-access items but has one major flaw: Justin can’t sit up completely straight while driving without bumping his head. Before you think we’re dummies for not measuring that properly, the shelf was already installed when we bought the van and is something we’re seriously considering raising up a couple of inches. Most people slouch a bit while driving anyway, but at 6’4”, sometimes you just need to stretch out your back. For anyone who’s gone down this road, you know the name Maxxair and you know their price tag. No, they’re not thousands of dollars but they’re not cheap (especially in Canada) and we’ve been putting off investing in one in a while. We might need to pick one up sooner rather than later because proper ventilation while cooking is pretty important and with the freedom to even use it in the rain, it would help a lot in getting the air in the van circulating and reducing condensation build up. Moisture is a huge issue we’re battling with now that the air is cooling and our breath isn’t. Every morning I tent up the bed cushions to allow some airflow under them since they quickly get damp from our body heat. It’s an inevitable problem that even million dollar RVs deal with that doesn’t seem to have a clear solution unless you have access to shore power to run a dehumidifier. If we had a slatted bed then at least the bottom of the mattress would get a chance to air out and (hopefully) not get as damp. Because our bed is also our table, we can’t really swap it out for slats unless we want to ditch the dinette system altogether. Even after switching all of our light bulbs to LEDs, they were still consuming more power than we were comfortable with. Although fairy/string lights are usually just decorative, we decided to hard wire them directly into our battery and install a switch. They use little to no power and light up the entire van at once, all while looking magical! 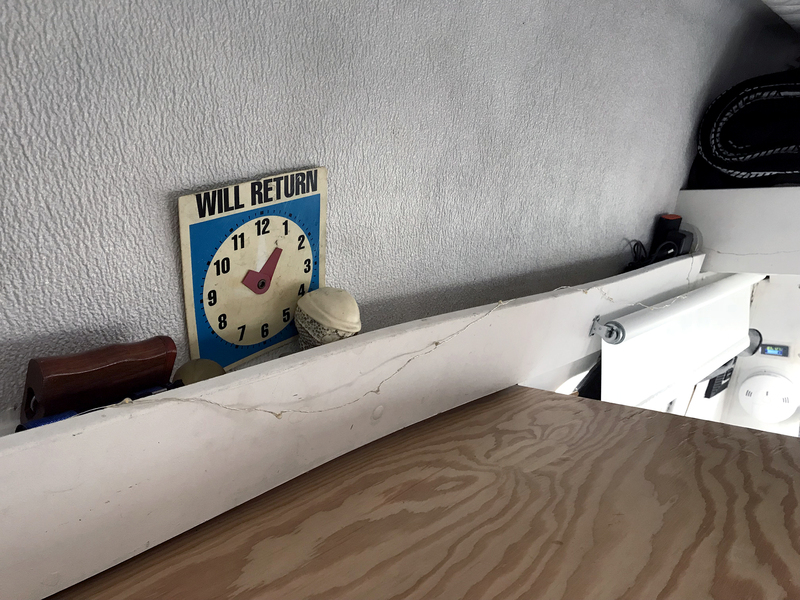 Along the seam of where the metal body of our van meets the fiberglass high-top, we added some wood all the way around with white MDF trim to create a shallow shelf that’s perfect for storing things like cords and spice jars. We opted for a peel-n-stick backsplash in “the kitchen” to make it easy to wipe clean while still giving 3D texture like real tiles. We didn’t want to fuss with grouting or the weight of real tiles so this made for a cheap and easy solution. 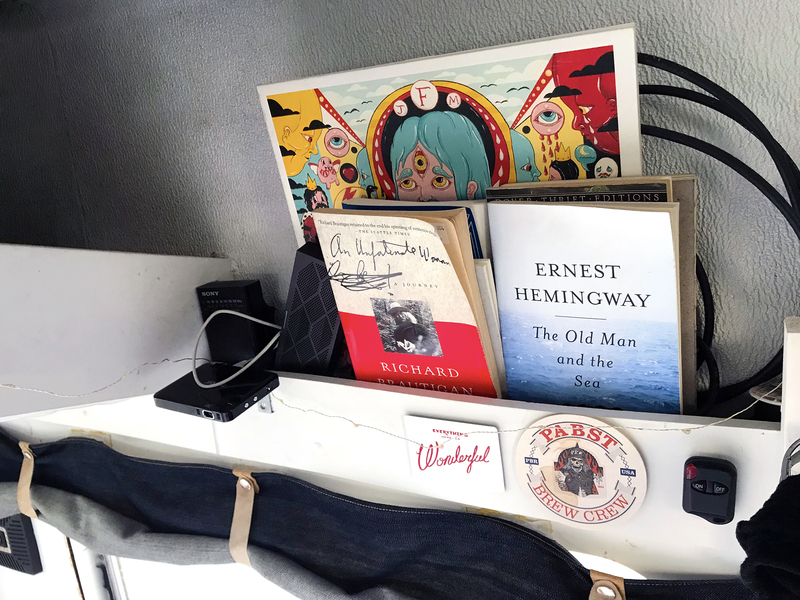 Securing things like our utensil jar and garbage can has helped to keep things tidy and not have to worry about things moving while we’re driving. 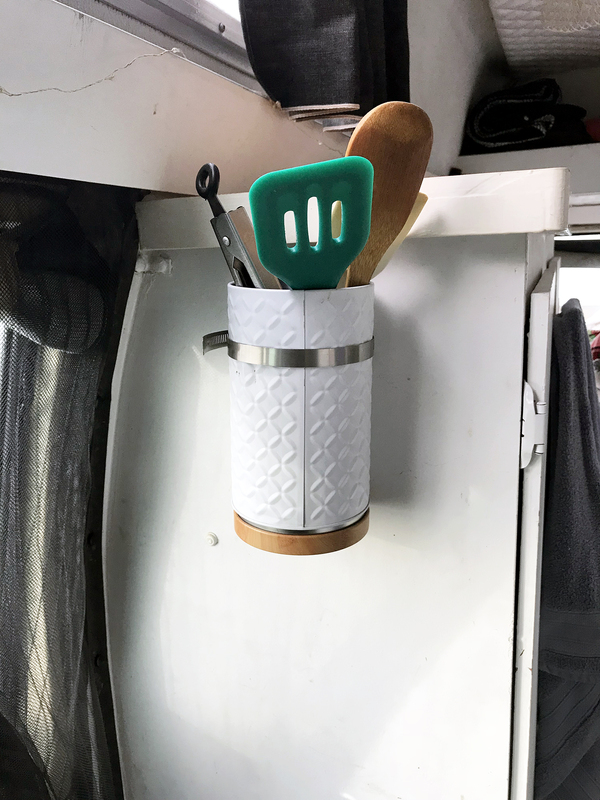 We used to have magnets glued onto our counter top to secure the utensil jar but some of the dirt roads we travel on gave them a run for their money. 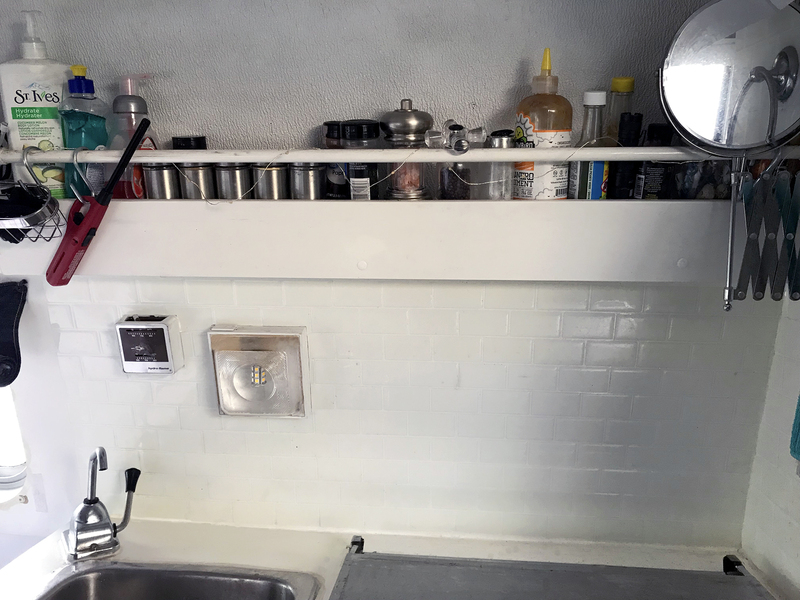 Now we have a hose clamp screwed onto the side of our cabinet so everything we need is fastened and accessible while the counter top stays clean. We think it would be really fun to start on a blank canvas after learning from the mistakes and design flaws we’ve already made. If you’re just getting started, the best advice we can give is to make small trips before your van is complete and test your plans before you set them in stone. Things can work great theoretically but you’ll never know how they’ll fare for you until you put them into practice…ahem, our dinette bed. Have you made any small changes that made a world of a difference? Designed something that didn’t really work out? Let us know in the comments below and we can swap stories.